FLOTUS knew exactly what she was doing. Her administration and her stylist/wardrobe consultant just chose to make her the most hated woman in America. If you missed it Melania Trump visited a ‘Children’s Shelter’ in Texas (this sick policy could be critiqued in a thousand blog posts and not be enough). 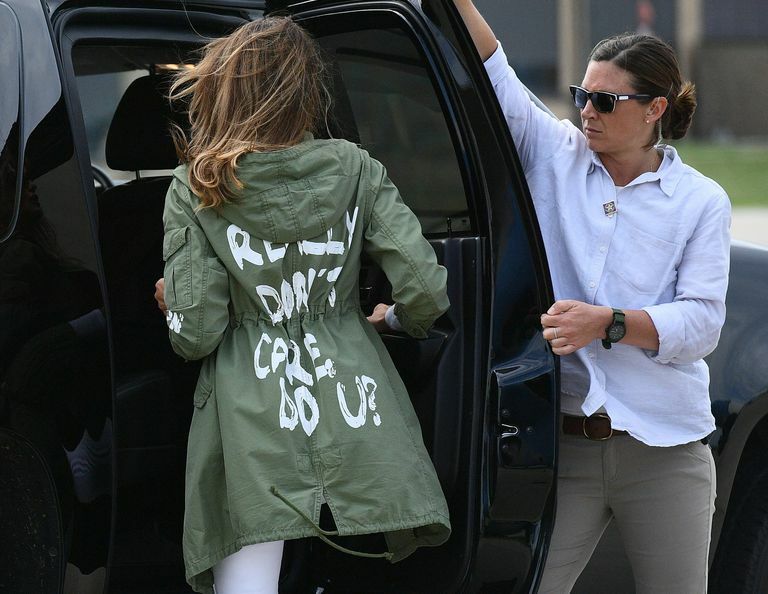 While boarding the plane in D.C. Melania was spotted wearing a jacket that said: “I REALLY DON’T CARE, DO U?” She did NOT wear the actual jacket to the ‘Children’s Shelter’ (what a saint!…not), but did wear the jacket getting on the plane. The jacket was completely deplorable and a despicable choice in attire. Everything we do is a choice. Every item of clothing is consciously or subconsciously calculated. You can choose to wear your yoga pants all day everywhere you do or you can choose to put on real pants. We ask our clients whether it be image/style or brand consulting “What message do you want to send when you walk into a room before you even say a word?” Our presidency, by the FLOTUS’ choice in attire, just chose to give mothers and families the middle finger. I have been a bit embarrassed by some of the choices our leaders have made and in turn our government, but this insensitive act has made me ill. Regardless of where one stands politically this was in poor taste and complete lack of decorum. At what point has did the moral compass of our county get completely thrown out of whack? Wow! Poor excuse for a human being. She’s got a whole PR team and stylists, how this was allowed I do not know! Love everything about this post! Especially how you got your point across without be vulgar or insulting to anyone! Thank you AlGstyle! Thanks, Janitza! We tend to steer clear of politics/going negative. This was a hard topic to refrain from.